Guard booths are important for the guaranteed protection of employees, products, and anything else of importance. So naturally, it’s equally as important that these enclosures and booths are of the best available quality to offer unrivaled protection. At Shelters Direct, we have been a trusted manufacturer and installer of high-quality guard booths for more than 20 years. Learn more about guard booths and their applications in today’s blog, below. A guard booth will make your facility more secure. The term ‘guard booths’ can refer to prefabricated guard buildings, security booths, and many other similar terms. In essence, a guard booth is any fortified structure meant to protect individuals who are performing security-related duties. This can include military guard structures, entry and parking control, overwatch and guard booths, and perimeter security stations. 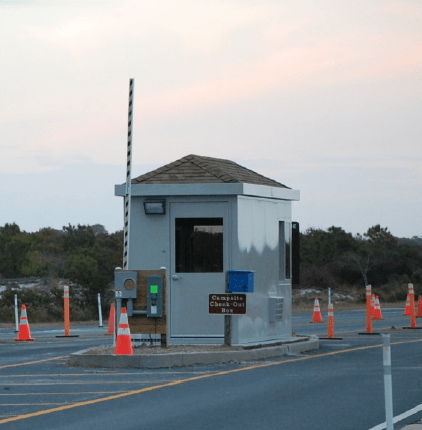 They act as a means of security to facilities, check points, and in some cases, where bullet resistant booths are requested, protection to the guard booths themselves. Given the wide range of applications for guard booths, it’s incredibly important they are manufactured with the highest quality materials. A military security booth with glass that doesn’t offer bullet resistance would not make sense. However, just because these buildings need to be formidable doesn’t mean they require lengthy and expensive construction. At Shelters Direct, all of our guard booths are prefabricated, so the majority of construction is done in our factory. Our booths come assembled and installation is a simple and straightforward process, ensuring that no time or money is wasted. This entry was posted on Monday, March 21st, 2016	at 11:44 am	. You can follow any responses to this entry through the RSS 2.0	feed. Both comments and pings are currently closed.